Visual Processing Skills- What are they and why do we need them? Visual processing skills are what our brain uses to make sense of what we see in the world around us. When a child is behind in the development of visual processing skills, learning can take longer, requiring more cognitive effort that slows down the learning process. Math, reading and writing are some of the areas where visual processing skills play a key role in how a child learns, and without the skills to excel in these areas a child’s self-esteem can suffer as well. A child who has not developed good eye movement, eye teaming, and eye focusing skills will often have more difficulty with visual processing skills. Fortunately, these skills can be treated and strengthened with vision therapy. Below are some visual perceptual areas and associated symptoms that are tested during a visual information processing evaluation. The Piaget Right/Left Awareness Test evaluates the understanding of laterality and directionality. For optimal visual processing, directional responses should be accurate and completely automatic. Delays in this area may result in difficulties reading and interpreting maps, directions and instructions. The Gardner Reversals Frequency Test evaluates the ability to write, recognize and match letters and numbers in their correct orientation. Confusion in this area may result in reversals of letters such as “b” and “d” and words such as “on” and “no” and “was” and “saw”. It will also slow down the speed of fluency or reading and writing. The ability to recognize the differences and similarities between objects and images based on shape and size, it is important to be able to distinguish between different letters and words in order to read and write. An important step in developing this skill is teaching your child to pay attention to detail. Which design is exactly like the one on top? The ability to find and pick out the important information in a visually busy background, such as picking out numbers in a word problem. Difficulty can also lead to poor planning/organization. The top shape is hidden in which picture? The ability to know what an image or object is when part of that image or object is missing. It is also the ability to quickly recognize differences in similar words to enable reading fluently. Difficulty can cause confusion of similar objects/words, and make it slow to complete tasks. If each design was completed and the lines were not moved, which one would look exactly like the design on the top? The abilities to recall visual information over time and to accurately recall a sequence of shapes or objects in the correct order, these skills are important for spelling and writing. Difficulties lead to poor spelling, poor recall of information, difficulty with remembering a sequence of directions, poor reading comprehension and difficulty with writing. 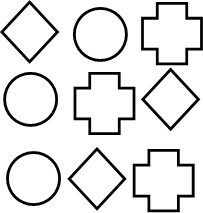 Remember the order of the shapes after you look away. Without looking above, which row is the correct order? The Beery Developmental Test of Visual-Motor Integration evaluates visual form perception and reproduction. Efficient visual-motor integration supports optimal eye-hand coordination. A deficiency in visual-motor integration may result in increased difficulty with handwriting, copying from one place to another and reduced ability to express ideas in written form. This is the ability to accurately relate an auditory sound with a visual symbol, or integrate what we hear with what we see. This skill relates to understanding phonics, reading music and reading fluency.